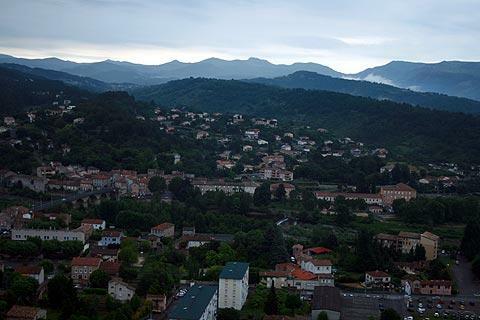 Aubenas is located in the southern part of the Ardeche department. 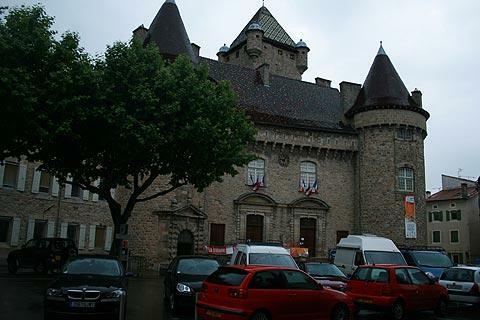 The town is located on a raised plateau with the town centre at the top of the plateau around the castle, which is also the main monument in Aubenas. Start your visit in the square in front of the castle. 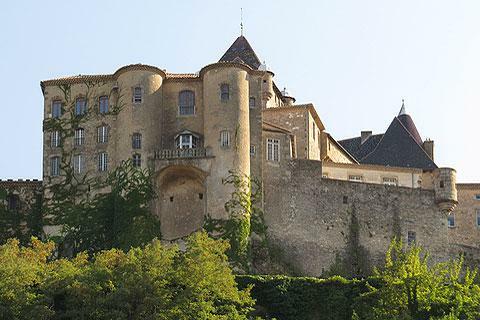 The Chateau d'Aubenas dates originally from the 14th century, when it played a defensive role. 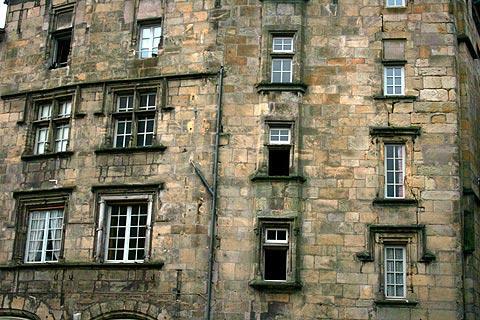 The castle we now see is largely the result of later renovations, mostly during the 17th century when the castle was converted into more comfortable accommodation, and a large range of architectural styles can be seen from medieval fortifications to decorative stones around the windows and a roof with colourful varnished tiles. 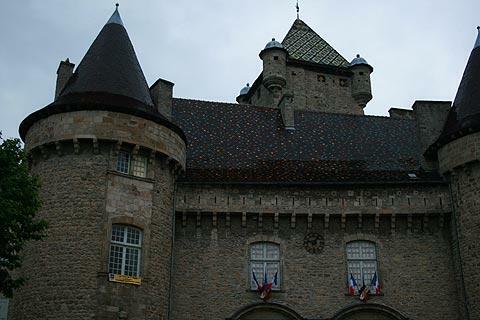 The castle also features a collection of paintings and sculptures, and is currently also Aubenas Town Hall. 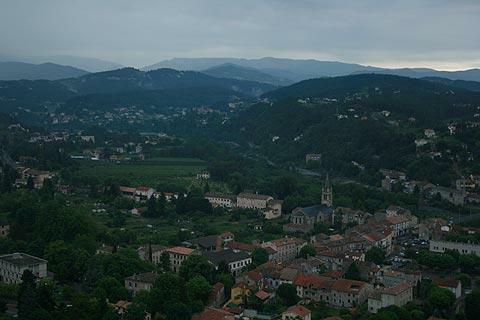 Not far from the castle in Place de l'Airette there is a viewpoint with far-reaching views (which you can also see from the castle donjon) - these views were very impressive even on the cloudy day when we visited, and on a sunny day would likely be a highlight of a visit to Aubenas. Radiating off from the square in front of the castle are several streets many of which contain shops and cafes, and some interesting buildings - in particular note the House of Gargoyles (Maison Delichères) on the castle square, and Rue Valleton. After descending the main street in the centre of Aubenas you will also come across the Saint-Benoit Dome, part of a benedictine convent that once stood here and has a renaissance style cupola added in the 18th century. The Dome Saint-Benoit now exhibits various religions artefacts and artworks. In the Franciscan Oratory called the Chapel of the Cordeliers you can see various 17th century religious sculptures and paintings then another important religious monument in Aubenas is the Church of Saint Laurent with a decorative 19th century facade, in the Place Jeanne d'Arc. The weekly market in Aubenas is held on Saturday mornings. 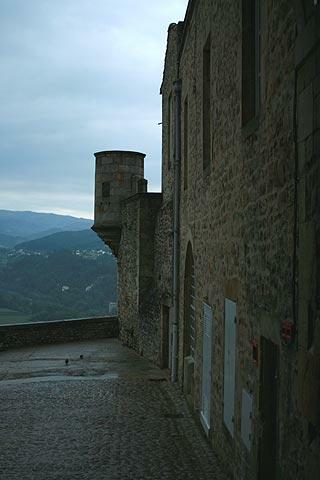 In the immediate vicinity of the town there are several small villages to explore, with our favourites including Vesseaux, Ucel and Saint-Privat. 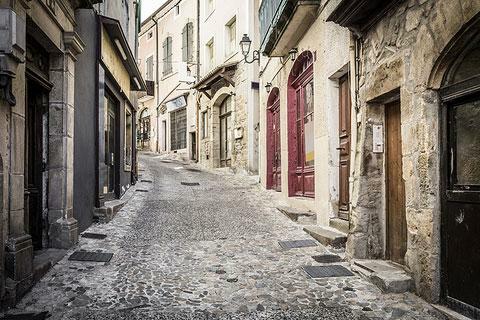 Aubenas is very well placed for exploring the Ardeche 'villages of character' - there are several that are located in this part of the Ardeche department: see the main Ardeche page for details.